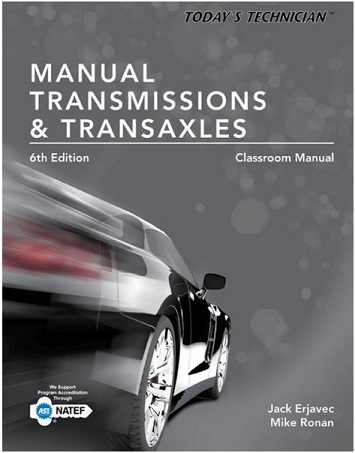 Reflecting the 2013 NATEF AST/MAST program standards, this fully updated Sixth Edition of TODAY’S TECHNICIAN: MANUAL TRANSMISSIONS & TRANSAXLES covers a wide range of must-know topics, including dual clutch systems, various limited-slip differential designs, and six-speed transmissions, while still addressing the basics, such as the importance of safe work habits and the purpose and major components of the transmission system and subsystems. Volume 1, the Classroom Manual, covers every topic on the ASE A3 Manual Drive Train and Axles certification test in a thorough, easy-to-understand manner, while Volume II, the Shop Manual, includes detailed job sheets that ask students to perform hands-on service and repair tasks that reflect 2013 AST/MAST task lists. Detailed full-color photos demonstrate exactly what students can expect when performing a procedure on the job. In addition, new references to high performance topics reflect recent advances in the fast-growing automotive performance industry. Thorough, well-illustrated coverage of theory and key concepts in the Classroom Manual helps students succeed on the ASE A3 Manual Drive Train and Axles certification test. Practical, NATEF task-oriented service procedures in the Shop Manual prepare students for effective on-the-job performance. Striking full color photographs illustrate actual repairs so students know what to expect when performing a procedure on the job. The book’s easy-to-understand presentation of technical concepts helps students master key content. A full color design and art program clarifies concepts and hands-on procedures to increase student success. Shop Manual and Classroom Manual content is cross-referenced for easy access to all relevant topical information. 1. Manual Drive Trains and Axles. 6. Drive Shafts and Universal Joints. 7. Differentials and Drive Axles. 8. Four-Wheel Drive (4WD) Systems. 10. Drivetrain Electrical and Electronic Systems. 11. Electronically Controlled and Automated Transmissions. 2. Special Tools and Procedures. 5. Servicing Front Drive Axles. 6. Servicing Drive Shafts and Universal Joints. 7. Servicing Differentials and Drive Axles. 8. Servicing Four-Wheel Drive Systems. 9. Diagnosing 4WD and AWD Control Systems. 10. Servicing Drivetrain Electrical Systems. 11. Diagnosing Advanced Electronic Systems. Content has been updated throughout to adhere to the 2013 NATEF AST/MAST program standards. Coverage reflects the latest technological advances in the rapidly changing automotive field. New coverage of high performance topics is integrated throughout the classroom and shop manuals to reflect recent advances in the fast-growing automotive performance industry. Job sheets in the shop manual incorporate the 2013 NATEF AST/MAST task lists.